Posted in: t-rex. 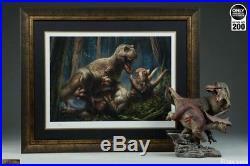 Tagged: premium, sideshow, t-rex, thirst, triceratops, unframed. ABOUT THIS ART PRINT. 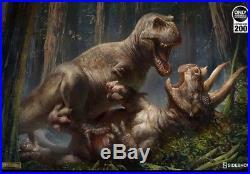 Sideshow is proud to present the T-Rex vs Triceratops Premium Art Print by RJ Palmer, pitting two prehistoric powerhouses against one another. 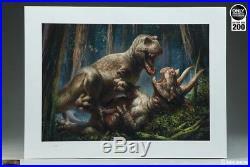 The struggle between the fearsome Tyrannosaurus Rex and the formidable Triceratops is the first print inspired by Sideshows own Dinosauria collection. 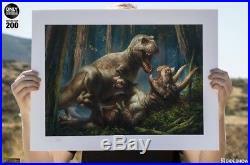 With the dueling dinosaurs sounded by a lush environment, this print captures the sheer majesty and terrifying strength of two ancient foes locked in a battle for survival. 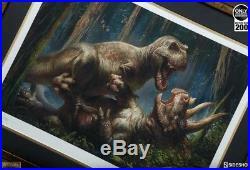 The T-Rex vs Triceratops Premium Art Print is limited to an edition size of 200 pieces, each hand signed by RJ Palmer. 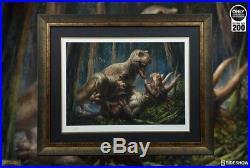 This primeval print is a mmust-havefor Dinosauria fans and creature collectors alike! Hand-numbered limited edition of 200. 24×18 fine art giclée print. 100% cotton, acid-free, matte Museo Rag 300GSM. 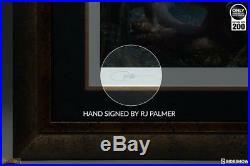 Hand-signed by the artist. Embossed seal of authenticity. RJ Palmer is a concept artist and illustrator from California, based in Burbank. He specializes in creature design for film and video games and his art has been featured the world over. Though he spends most of his time drawing and being harassed by his cat, Scooch. 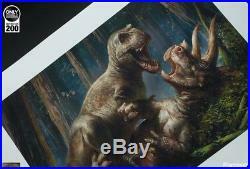 The item “T-Rex Vs Triceratops Thirst Sideshow Premium Art Unframed” is in sale since Monday, December 11, 2017. This item is in the category “Collectibles\Comics\Posters”. 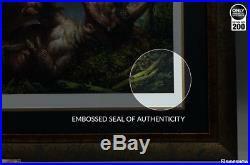 The seller is “leof1973″ and is located in Yonkers, New York. This item can be shipped to United States, Canada, United Kingdom, Denmark, Romania, Slovakia, Bulgaria, Czech republic, Finland, Hungary, Latvia, Lithuania, Malta, Estonia, Australia, Greece, Portugal, Cyprus, Slovenia, Japan, China, Sweden, South Korea, Indonesia, Taiwan, South africa, Thailand, Belgium, France, Hong Kong, Ireland, Netherlands, Poland, Spain, Italy, Germany, Austria, Russian federation, Israel, Mexico, New Zealand, Philippines, Singapore, Switzerland, Norway, Saudi arabia, United arab emirates, Qatar, Kuwait, Bahrain, Croatia, Malaysia, Brazil, Chile, Colombia, Costa rica, Dominican republic, Panama, Trinidad and tobago, Guatemala, El salvador, Honduras, Jamaica.